Based on the patented and proven BeyondRAID technology, Drobo's ability to deliver "Big Storage in a Small Box" creates the best storage experience ever. 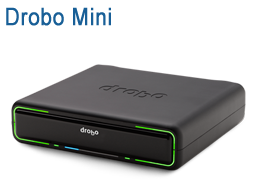 With Drobo, buy just the storage you need now and expand it as the amount of data you need to store grows. Mix and match drive brands, capacities, and speeds. Replace your smallest drive with a larger one and immediately use the new capacity in a matter of seconds. It's as simple as inserting the new drive into an empty slot or replacing a smaller drive with a larger. Expand up to 16TB on a single volume as larger drive sizes become available. 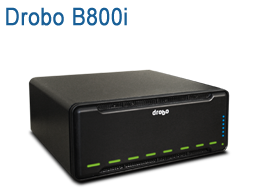 Drobo creates one large storage pool. Dive in and eliminate the need for multiple external storage drives and devices. Safety access and quick access go hand in hand with Drobo. Whether you're directly attached to your personal computer, sharing files with others over the network, or backing up a business application - Drobo's the best choice. Drobo connects to Mac, Windows, Linux, and server virtualization systems with ease. Everyone can take advantage of simple, powerful, and complete Drobo data protection. Just plug in Drobo and your data protection is ready. Add disks at any time for additional protected capacity. Drobo can even solve problems by itself. Lights on the front tell you what's happening - if you can read a traffic light, you're already a Drobo expert. Take a look at the lights on the front of a 5-bay Drobo. They work the same way on all Drobo models. Cali Lewis explains Drobos and the many ways to use Drobo for your home or business. Are you running out of capacity on your file server? 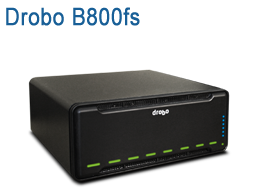 Drobo explains how a Drobo can help with growing your file server. "Veeam Backup & Replication changes your whole environment. It is easy to install and manage, and the speed is phenomenal..."
Bill Goodrich, IT Manager of Eppley Cancer Center in Omaha, Nebraska, utilizes a Drobo B800i to backup documents and countless high-resolution image files. Our specialists are expert in designing data center solutions and can help you create a plan for sourcing and deploying your Drobo solution. 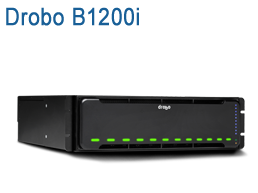 Optrics offers personalized Drobo product training - a service designed to help you integrate your Drobo solution smoothly into your network infrastructure. Very fast. I was expecting the order to completed within a day or so, not minutes.